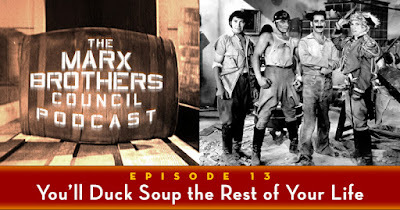 Screenwriter and Marx Brothers fanatic Cinco Paul (Despicable Me, The Secret Life of Pets, Bubble Boy) joins the guys to discuss and play their favorite musical moments from Marx films. Cinco also talks about how the Brothers influence his work, and the Marx references he has and has not been able to incorporate into his films. Songs include…nah, you’re going to have to listen. In the Monkey Business sax number, it sounds like there is only one sax being played. Therefore I think it's actually live because they only needed one brother to play the sax badly. I have always thought that Chico's "Everyone Says I Love You" does not have Chico playing the piano. There are many reasons for this. First the style of the piano playing is not the Chico style. Second, there is no camera shot of Chico's hands throughout the song. And lastly it sounds like the piano is being played off stage. There is an echo similar to the orchestra in Animal Crackers that tells you that the piano was probably a distance from the actual stage. Lastly you have to remember that the early Paramounts were made in the early days of talkies. Dubbing was very primitive as can be witnessed by Chico's line in Duck Soup "Believe me he's one smart dog." In most cases dubbing is VERY obvious. I was all ready to dispute the Chico piano thing until took a look at it again, you're most probably right...good catch. OK another comment (I'm writing these as I listen). Harpo is definitely playing a real harp in the close ups in Races. You can tell because of the flexibility of the strings (piano strings will not bend and stretch like that) and harp strings have different colors so that the harpist knows where certain notes are for reference. As far as popular songs in the Marx' movies don't forget "Who's Sorry Now" which was a number 3 hit in 1923 and a number 4 hit by Connie Francis in 1958. Finally (and yes, this is final) isn't a Monkey Gland a cocktail? I seem to remember that from my bartender days. Great podcast. I look forward to it every month. Thanks, DW -- astute observations all! Though it could be that Berlin was merely referencing the cocktail, and endorsing it as a pick-me-up, innocent of the original meaning. On a related note, in Woody Allen's BULLETS OVER BROADWAY, the Harvey Fierstein character says, when asked about the renewed vigor and youthfulness of the Dianne Wiest character: "The monkey glands are working!" 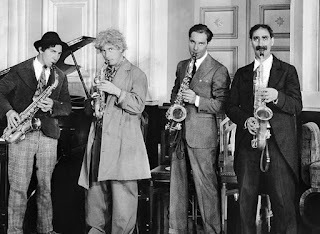 - I agree with Cinco in how great Groucho's song early in Duck Soup was. That song, along with the preceding conversation with Margaret Dumont was where I was really beginning to get a sense of his character. - Horse Feathers and Duck Soup were my initial 2 favorite movies. They, along with Monkey Business and Room Service, were the first movies I ever saw, and it would years and dozens of viewings of all 4 of those before I would get to see another MB movie. So, with HF and DS having music in general, and the brothers performing some of them, I naturally concluded that music was part of who they were, and that fact, among others probably, is why I liked those 2 more than MB and RS at first. - I am with all of you in really loving "Everyone Says 'I Love You'". It is an easy and flexible song, and I have always liked that all 4 of them get to perform their own tailored version. That said, Chico's is my favorite, and as was mentioned, it is a shame he did not get more opportunities to sing. - During the discussion regarding Chico's playing style and his shooting, I started thinking I had read something about it. I have read a few books and articles, but not many. I grabbed by copy of "Harpo Speaks," and found what I had been thinking of. It does not specifically mention Chico's "shooting" the keys, but it does discuss his right hand play. You all may know this already, but I thought I'd share what I found anyway. This, I later realized, was all the better, because Chico's teacher had a certain limitation. She could teach only the right hand. When she played, she faked with the left. Chico kept asking, at first what he should do with his left hand, and the teacher would say sharply, "Never mind--that hand's where the music is"--accenting the statement with a whack of her ruler on her pupil's right knuckles. So Chico Marx became, at the age of thirteen, the best one-hand piano player in New York City. Well, the best one-hand player east of Lexington Avenue and north of 59th Street." The first time I saw Chico onstage was in a a theatre on 86th Street and Third Avenue. For a finish he played requests from the audience, blindfolded and with a bedsheet spread over the keyboard."